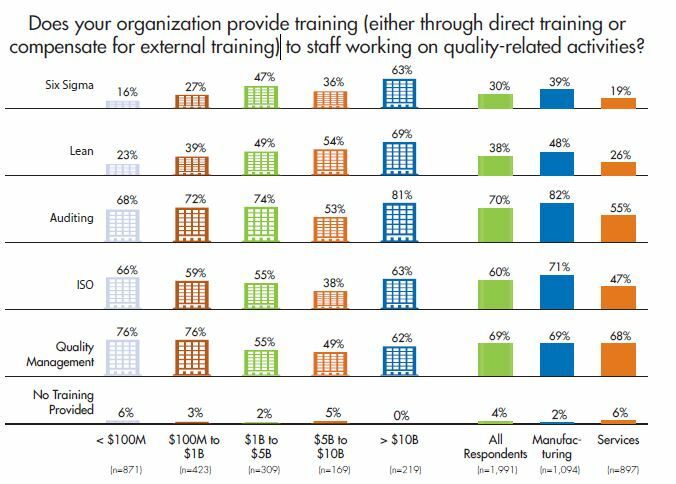 In August, ASQ CEO Paul Borawski penned his thoughts about companies providing training around quality, using data from the Global State of Quality survey to show that companies with centralized quality departments were more likely to provide quality training and that only 5% of surveyed organizations said they provide no quality training at all. One of the key points he touched on was that the majority of organizations that do provide quality-related training only provided such training to those individuals who were “directly involved in the quality process.” I believe this to mean the direct quality-measuring/checking/improving/engineering/managing/auditing roles, when in truth every single person touching a process is thereby involved in the quality process. This definition encompasses more than mere audits or standards, measurements or checks. Quality isn’t centered around any particular function – however, every function is centered around quality. Every process step, every touch, every change has an impact on meeting those customer expectations because they all consume time or resources and it is imperative that all process users maximize their results in meeting those customer expectations. So if every process step contains elements of quality (who, what, when, where, how) then shouldn’t every individual involved in those process steps receive some degree of quality training? Every stadium concessionaire is involved in quality – they are all responsible for finding better ways to meet customer expectations for safety, quality, and delivery. Are they aware of this? Now…what is quality training and why does it matter? I think there is some ambiguity about the definition of training relative to learning – they are inherently different. I see training as being direct, specific, tactical, and skill-driven. Training is limited in scope and is a direct connection among practice, knowledge, and results. Training brings the skills of users up to an even level and is an attempt at standardizing the application of those skills/best practices across users. It covers a lot of the who-what-when-where of achieving quality results. Learning, however, is more strategic, subjective, ambiguous, and less limited in scope. Learning builds on the training skills (who-what-when-where) and asks why, how, and what if so that there is deeper understanding of why we’re doing what we do. Quality training through classes, direct supervision and onboarding, and comparison of results achieved to results expected is a valuable and tactical approach to achieving quality. This training can also come through standardized work, demonstration, and practice. This type of quality training should be a bare minimum for all employees touching value-adding processes that have customer expectations tied to them. If employees are unaware of this fact, then it is the fault of management. One more point about quality training – some companies provide a suite of quality training programs to employees that may or may not be directly related to the processes they use. Just like it is unreasonable to attempt to train a dog to drive a bus, why would companies set goals around getting employees to engage in certain elements of quality training that aren’t going to quickly provide applicable results? Lean Blitz Consulting provides different types of quality training, such as with Lean and Six Sigma concepts…but only where using those new skills will be appropriate. We are not prescriptive and do not put the cart before the horse – before we suggest any degree of quality training offering, we determine where the training gaps are between what skills and knowledge exist and what skills and knowledge are necessary to meet customer expectations. I’m not going to teach a class on poka-yoke to a group of individuals who either already know and apply poka-yoke daily, but I’m also not going to provide it to individuals who don’t even know what their customer expectations are in the processes they currently use. ← Does University Come Before or After the State Name? Pingback: Taiichi Ohno | Lean Leadership | Mentor | Lean | Champion |Lean Blitz – Do it better.